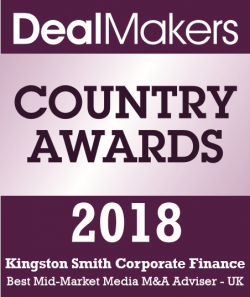 Kingston Smith Corporate Finance is delighted to announce that it has been ranked Best Mid-Market Media M&A Adviser for 2018 by DealMakers Monthly. The awards recognise the best firms and individuals in their country. Nicola Horton, Principal at Kingston Smith Corporate Finance says: “We’re so pleased to receive this award. It acknowledges the spread of transactions we’ve worked on for clients and the trust our clients have put in us”. and the AIM re-admission of Parallel Media Group.